Welcome to Saint Patrick Catholic Church. Presented by Father Shawn Landenwitch. Let the Bible come alive for us today! Learn valuable spiritual lessons to enhance your Lenten journey. See Christ and His mission through a new lens. Bring a Bible. Optional potluck following the talks. The talks build off each other, so attend both if possible. Located at Winner Harvest Barn, 7317 OH-47, De Graff, OH 43318. 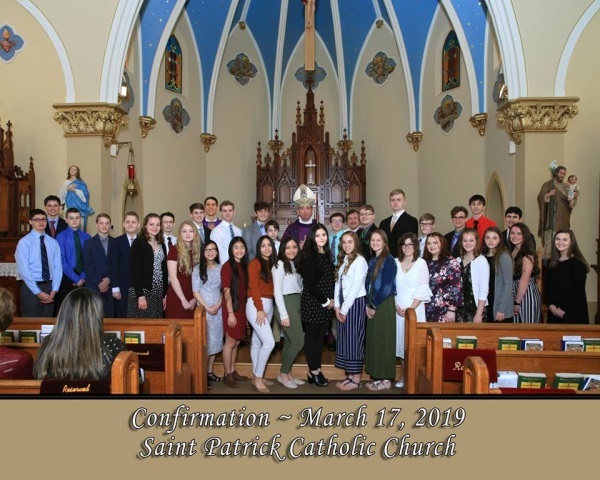 Confirmation with Archbishop Dennis M. Schnurr. Located at Saint Patrick Church's Makley Hall. Menu: Coop and Company famous fork tender baked in Irish whiskey corned beef (you won't be disappointed), boiled potatoes, carrots and cabbage, and Plaza Inn's broasted chicken, mashed potatoes & gravy, green beans, mac & cheese, rolls and butter, ice tea and lemonade. Cake for dessert. Attend mass at 4:00 p.m. if you wish. All are welcome! 5:00 pm - 7:00 pm K of C Fish Fry. See Fish Fry for details. All are welcome! Any age, music talent, lets share God's gift of music with one another! Land of Peace is a nonprofit organization representing Jerusalem Christian Families scheduled to visit the church Nov 10-11, 2018, regarding selling religious articles from the Holy Land. In 1920 the Christian population in the Holy Land was 80%; today it is less than 2%. With the parish support and the parishioner's generosity we are able to help our brothers and sisters to live in Jesus land of birth. 4:00 pm at St. Patrick Church. Find the freedom God intends for you! Do you find yourself struggling with the same sin time after time, stuck in your spiritual growth, struggling with forgiveness or bound by negative patterns of thinking? The Unbound: Freedom in Christ Seminar will present 5 keys to greater freedom in your life - Repentance & Faith, Forgiveness, Renunciation, Authority and The Father's Blessing. The seminar is Saturday, November 10th from 8:00am - 4:00pm at St. Patrick Church - 328 E Patterson Ave, Bellefontaine, OH. It is presented by the Unbound Team here at St. Patrick's Church with some live talks and some talks on DVD by Neal Lozano, the creator of the Unbound Model. Prayer opportunities will also be provided throughout the day. Breakfast snacks and lunch will be provided. The cost is a donation. For more information contact Carrie Kline at Unbound.LoganCounty@gmail.com or at (937) 935-8188. 7:00 am in Makley Hall RCIA Room. • See the data that living in union with Christ provides us the grace to overcome the challenges to remain faithful to love. • Learn some of the challenges to love - both internal (fallen reward system) and external (fallen world). • Have a forthright discussion about the need to take our spiritual lives up a notch. If we want to be victorious in our battle over the bride, we must receive the grace to do it. • See the research relating to the “dark side” of technology: it frequently leads to isolation, which is a major issue for our youth. • See the amazing science behind our ability to use other people to expand beyond ourselves. • We need to spend more time with people than technology! • How much time do you spend on technology at home? How can you get it under control? Cost: Material $40 per Person or per Family. Half Price for Students ($20 each). See What is the IOTC_2-24-17. See IOTC Promo 0.6 Syllabus. See IOTC Comments from Past Attendees. View Promo-1: Introduction and Invitation (Trailer). View Promo-2: What Makes You an American?. View Promo-3: Will We be Ignorant or Free?. 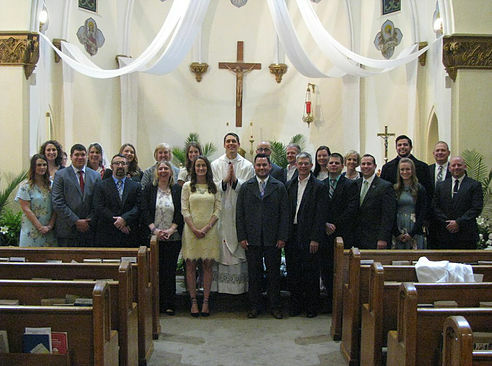 Rite of Christian Initiation of Adults (RCIA) with Father Landenwitch. With Rev. Shawn Landenwitch. 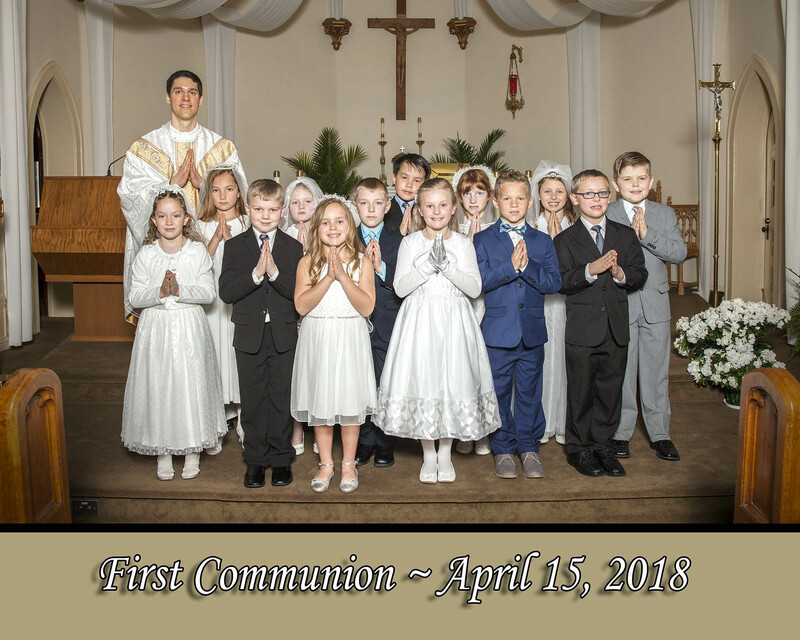 Listen to First Communion Homily. 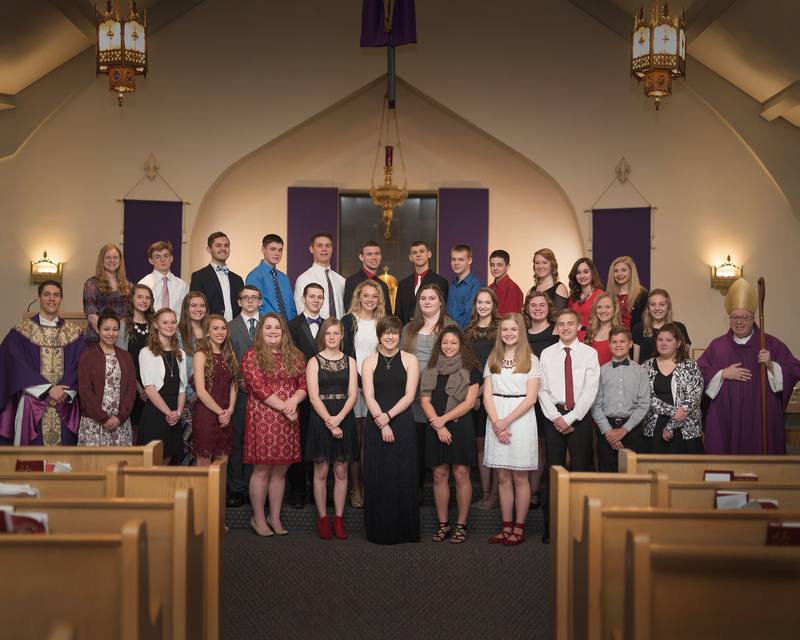 Both Saint Patrick and Saint Mary of the Woods Freshmen and Sophomores. Held at Saint Mary of the Woods Catholic Church. Celebrants: Most Rev Joseph Binzer on the right and Rev Shawn Landenwitch on the left. 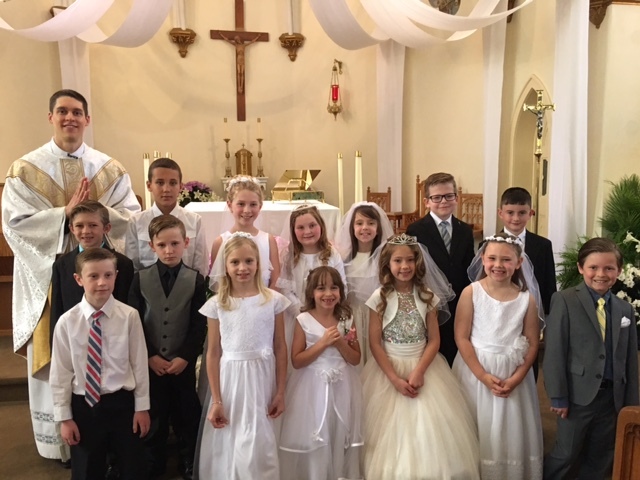 Copyright © 2019 Saint Patrick Catholic Church, Bellefontaine, Ohio.